Yesterday was National Face Your Fears Day gives you the chance to stand up to what you are most afraid of and to seize the day. This December, join Conor O’Malley and discover the movie about finding courage and learning to be brave. A visually spectacular and unabashedly emotional drama from director J.A. Bayona. 12-year-old Conor (Lewis MacDougall) is dealing with far more than other boys his age. His beloved and devoted mother (Felicity Jones) is ill. He has little in common with his imperious grandmother (Sigourney Weaver). His father (Toby Kebbell) has resettled thousands of miles away. 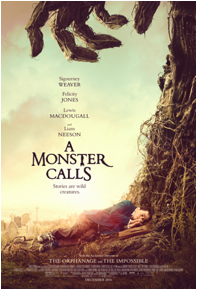 But Conor finds a most unlikely ally when the Monster (portrayed by Liam Neeson in performance-capture and voiceover) appears at his bedroom window one night. Ancient, wild, and relentless, the Monster guides Conor on a journey of courage, faith, and truth that powerfully fuses imagination and reality.